Need a fast, easy dinner? 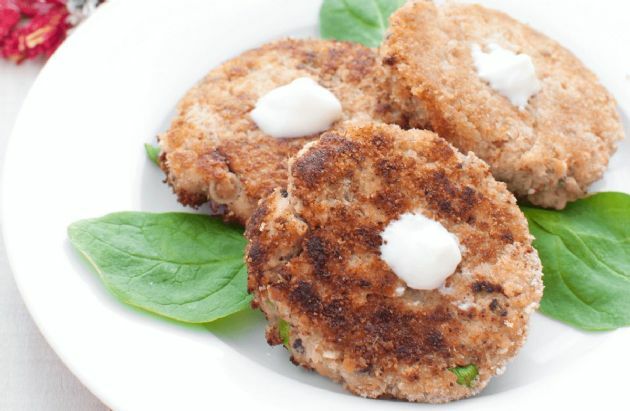 Make these simple salmon patties. Pair them with rice topped with black beans or cheese grits and spinach. Need a fast, easy dinner? Make these simple salmon patties. Pair them with rice topped with black beans or cheese grits and spinach. Finely chop the celery, onion, and pepper. Remove the skin and bones from a can of salmon. Combine the vegetables, egg, salmon, breadcrumbs and seasoning together. Using an ice-cream scoop, place scoops of the mixture onto a well-oiled griddle. Cook about 5 minutes on each side (until browned). Remove from heat. Top with horseradish or ketchup if desired.